Apple picking is fun and something to look forward to every year. 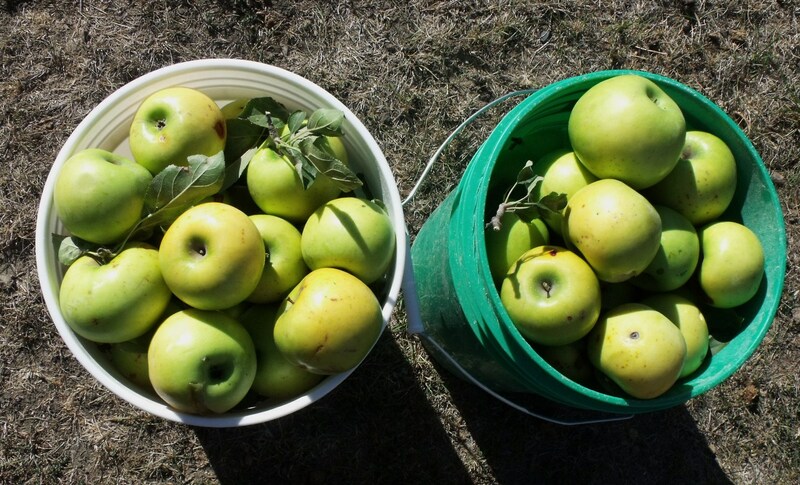 We had some pretty good yields of apples on our apple trees this year, some were first time producers. The Sweet Sixteen tree did well this year and I recall nostalgically that we planted that apple tree for Jessi when she turned 16. There was not a huge yield but enough to eat fresh and freeze a bunch for apple crisps. 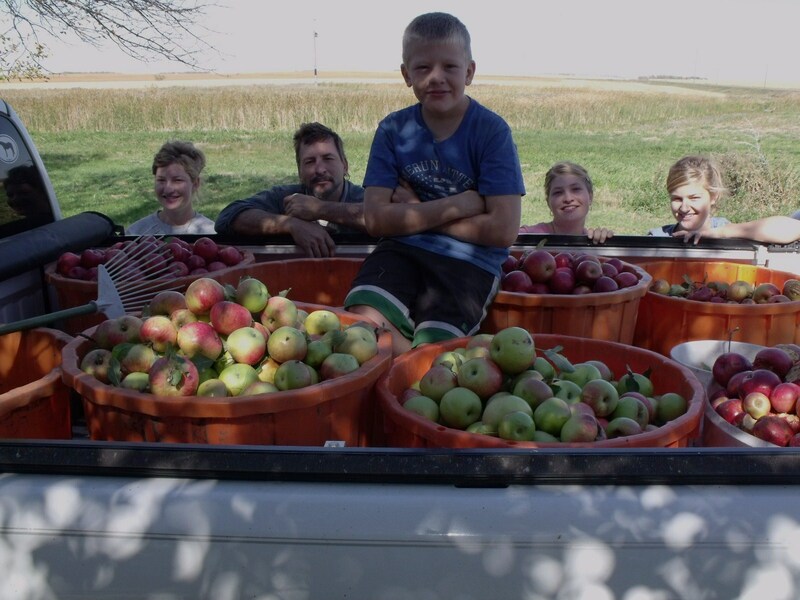 Thanks to a couple of nice farmers in our county, we were able to pick and use even more than what grew on our farm. 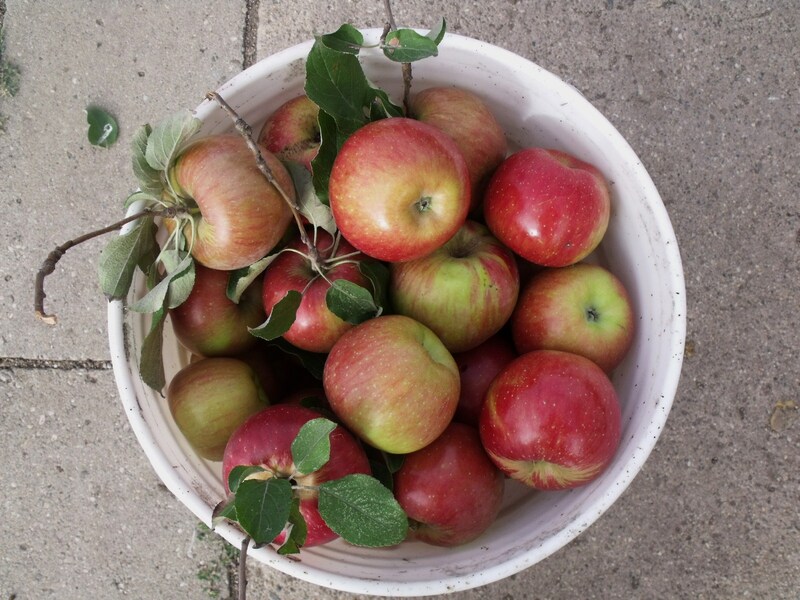 The apples on the ground that were not good enough to use are being fed to our hogs and chickens. Since we had a bunch of old aluminium pie pans on hand, we decided to make up raw apple pies to freeze. It worked out great and I’ll show you how we did it. So far we froze over 150 pies between us and Frenchy. That may sound like a lot, but they also make great gifts and easy treats for unexpected company and when we are all together, one pie doesn’t go very far! Then, you never know from one year to the next whether there will be apples or not. Especially with the drought that we are experiencing. Hold your mouse over the photos! 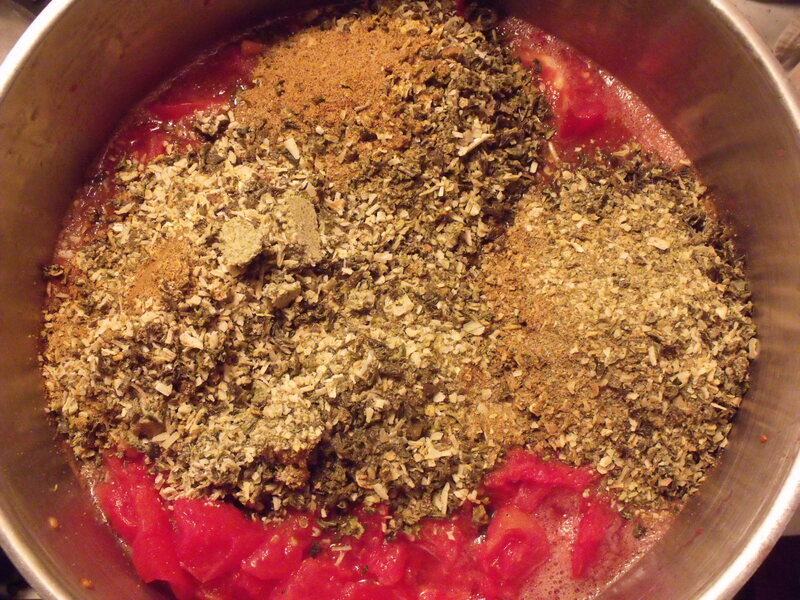 Just mix the dry ingredients up first then blend in the lard, followed by the water, egg and vinegar. Do not over mix or it will become tough later. Lard must be softened naturally, not on the stove. 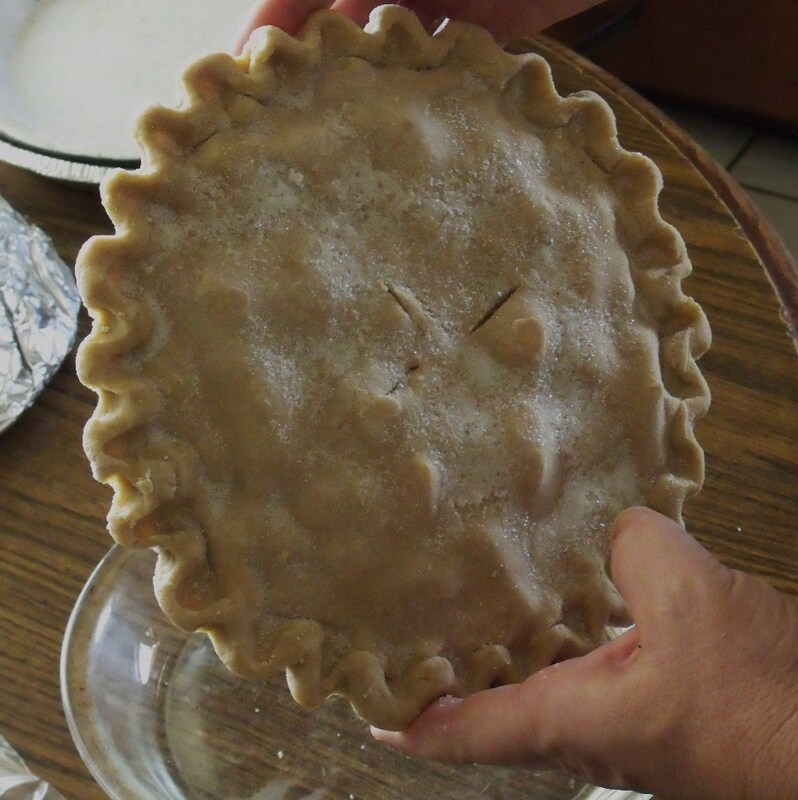 This is one of the most important tricks to making a good flakey pie crust. Moist dough is way better than too dry……..remember that! Chill dough in the refrigerator for at least 30 minutes. 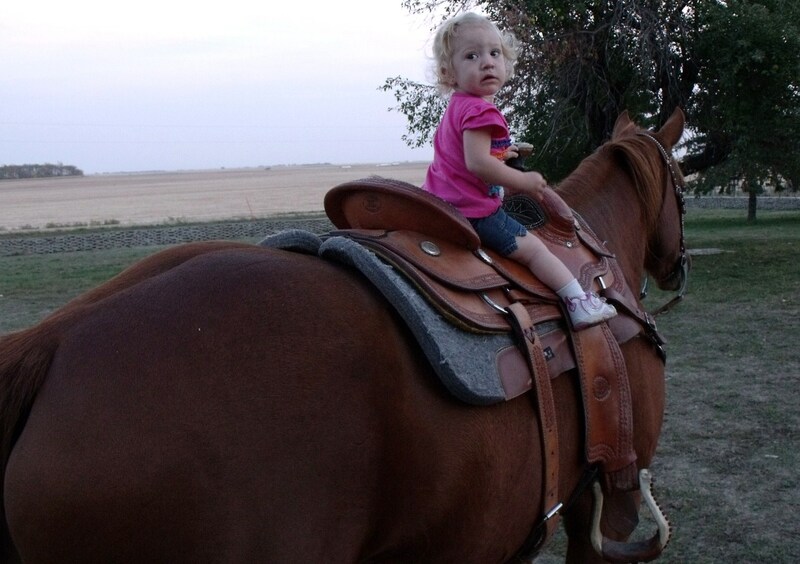 When we did this we made up several balls and chilled them ahead of time. Keep them wrapped air tight. In a bowl, pour the above ingredients over the apples EXCEPT for the butter. You shred that on top of the apples after you have filled the pie. 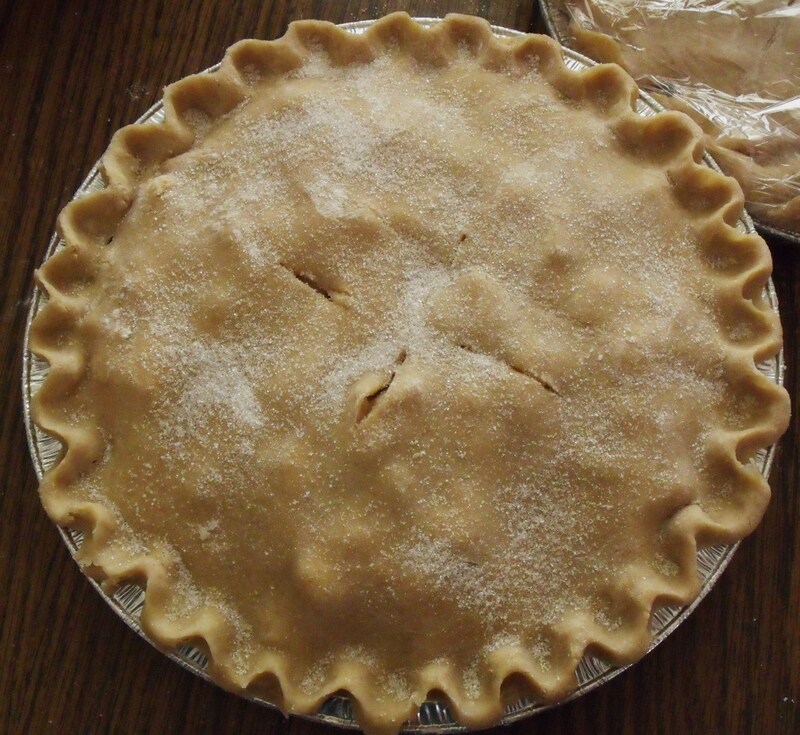 After you put the top crust on the pie, wrap the raw pie in clear plastic wrap and freeze overnight or until it is frozen solid. 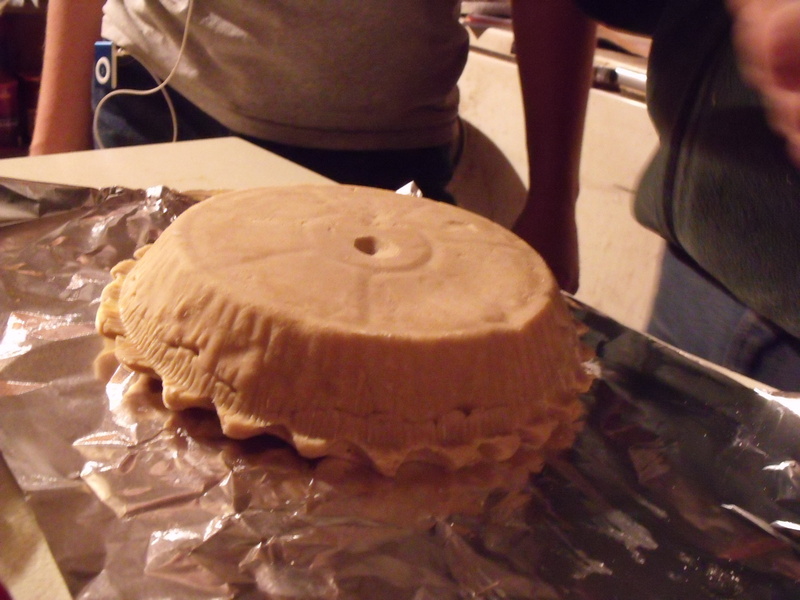 Then simply pop the frozen pie out of the tin and wrap it in foil and place in a gallon freezer bag. 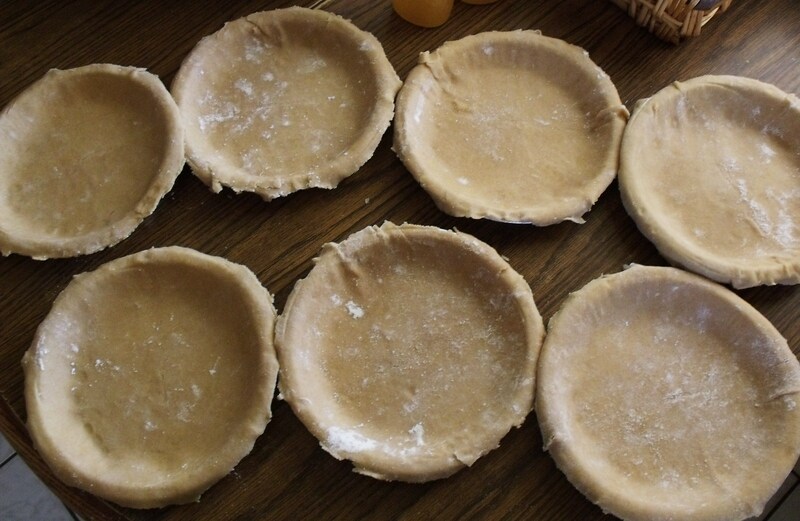 Then you can reuse all the pie tins again and make another batch. 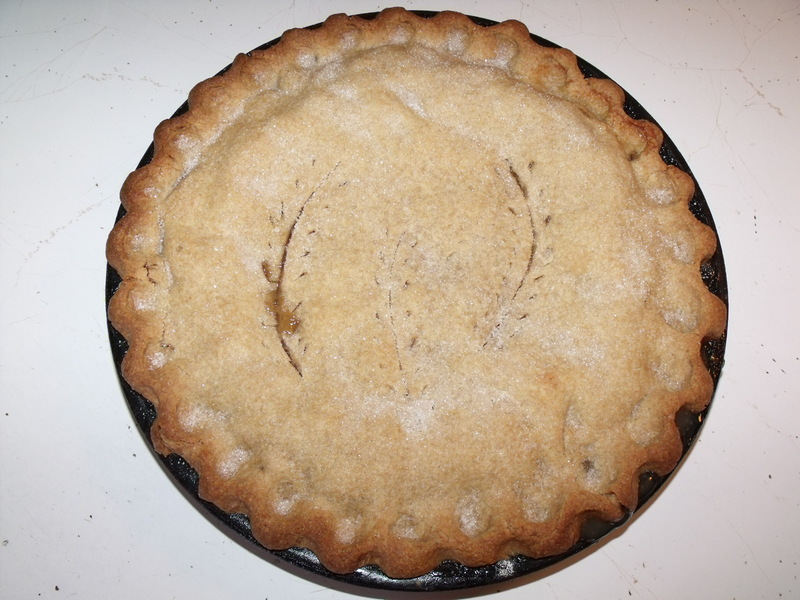 When you want a pie, pre heat your oven to 400 degrees and when it is hot, take the pie out of the freezer and slip it into the aluminum pie tin and bake approx. 10 min. 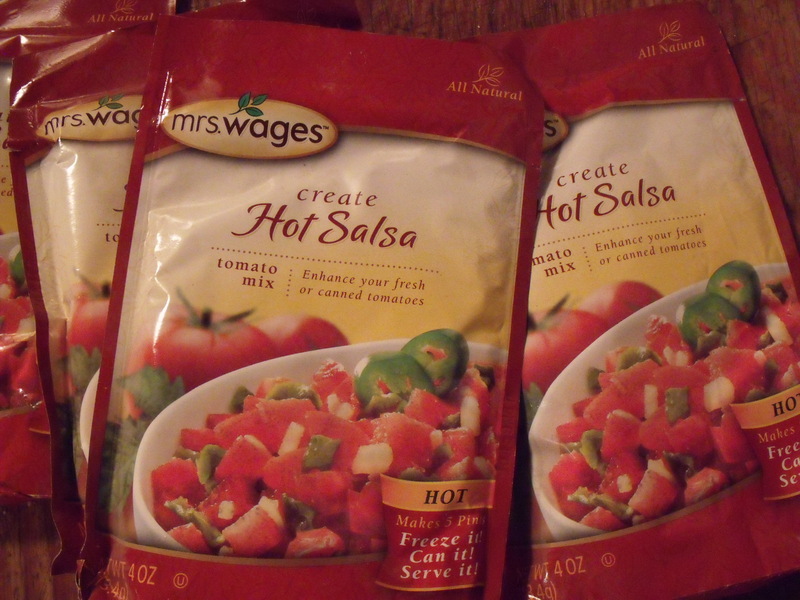 Reduce heat then to 350 degrees for another 40 min. Oven temps. will vary, mine is a gas stove. 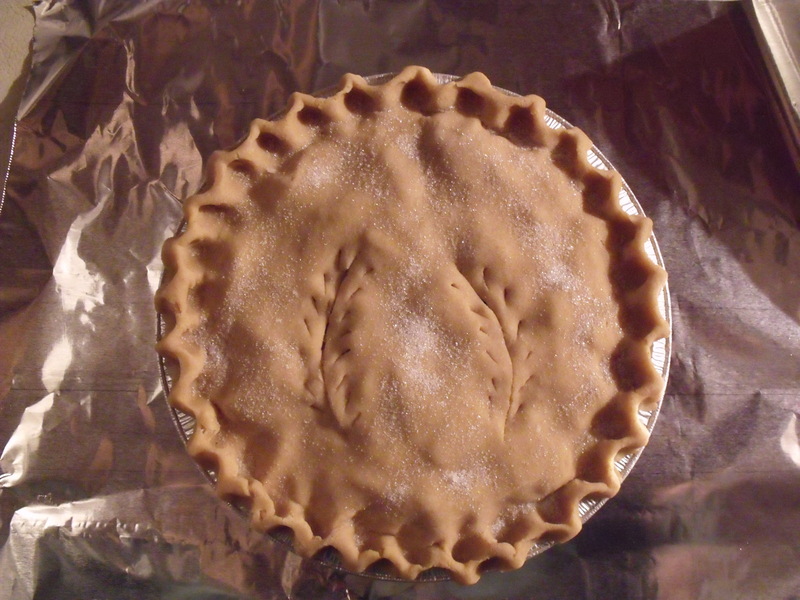 If you don’t have aluminum pie tins you can use glass, but you have to line the glass pie plate with aluminum foil BEFORE you put the crust and filling inside. This way you can still take the form off. I don’t dare bake a pie from a dish that was glass and frozen. This method allows you to reuse the glass as your mold. This is so easy. So far we have used the pie tins six different days. We also used some glass and tin pans. We are still dealing with tomatoes and this year moved the plants into the butcher shop to ripen on the vine. My grandmother used to do this in Italy so we tried it. 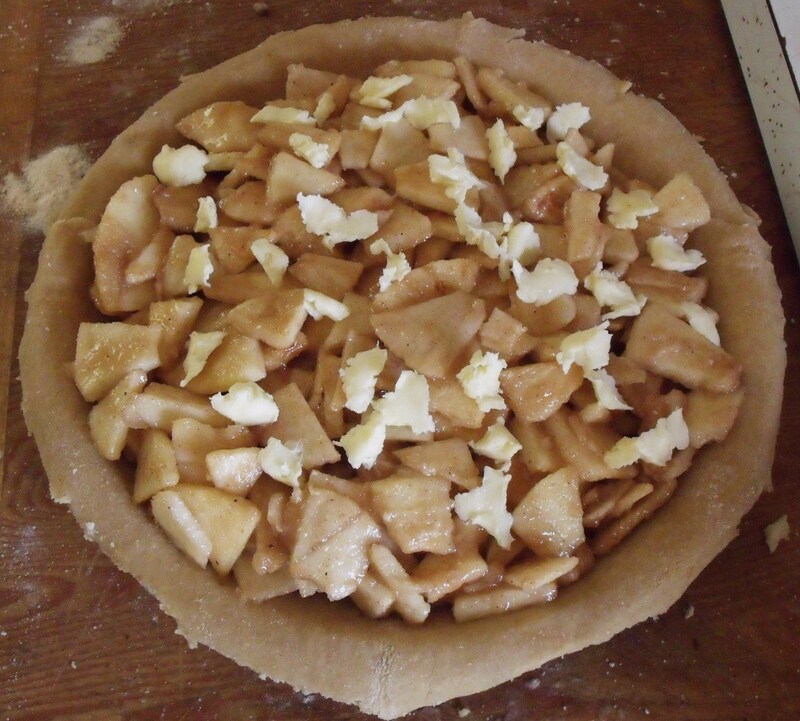 This entry was posted in FARM KITCHEN and tagged freezing raw apple pies, lard pie crust, whole wheat apple pie crust. Bookmark the permalink. 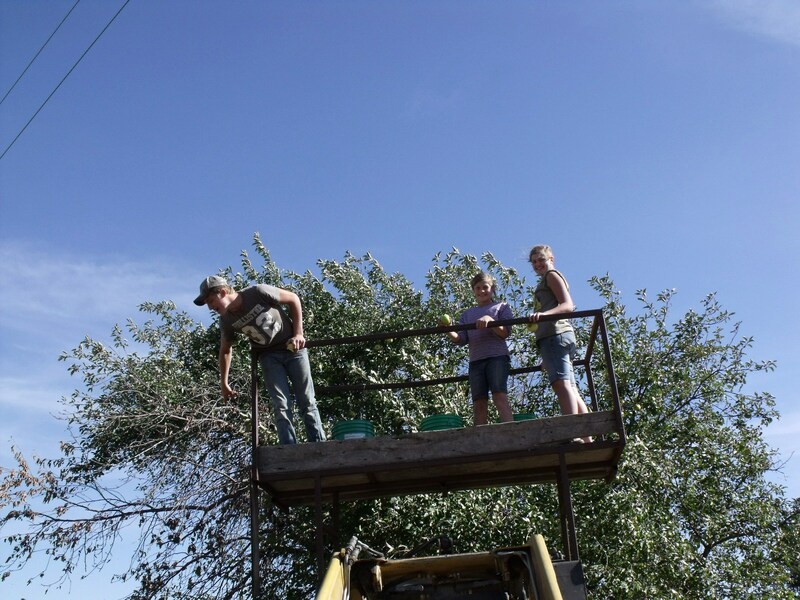 The Dougherty Family……..what great people, and what a great farm:)) It was so good to see you all. Wow! You must have lots of Freezers to hold so many pies! Yum! Karla, They don’t take up all that much room really. I doubled two pies per gallon freezer bag and they stack up very nicely. 40 of them are up at Frenchy’s house too. Glad to hear from you, take care. 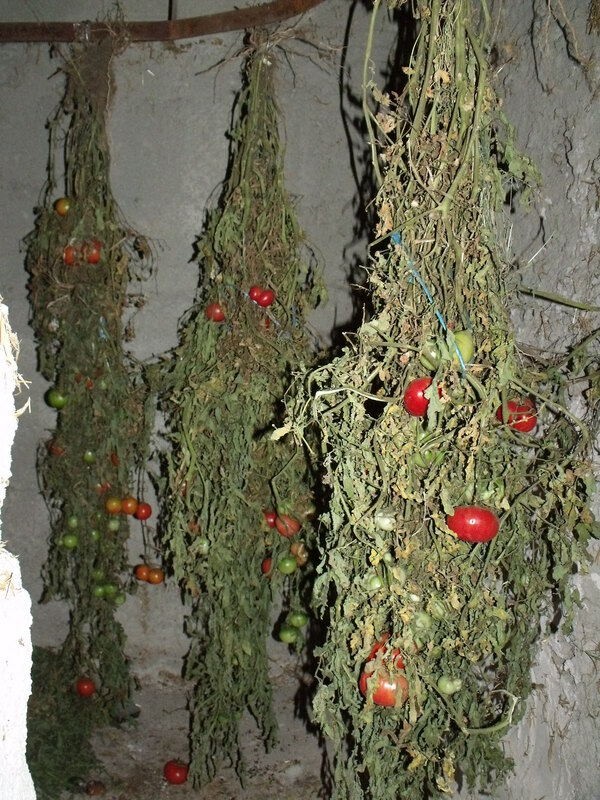 I love the hanging tomato idea.